Mr. Taxi Driver, You Are GOING TOO FAST!!!! : Goats and Soda Kenya's passenger vans have a reputation for getting into deadly crashes. A new campaign has cut the accident rate with a simple intervention: stickers that urge riders to speak up. Mr. Taxi Driver, You Are GOING TOO FAST!!!! The worst traffic accident I've ever seen happened on a highway in Kenya. A friend and I were returning to Nairobi from Lake Naivasha when the cars in front of us came to a halt. I pulled onto the shoulder and spotted a 15-passenger van — a matatu in local speak — on its side, split open like a coconut. Another matatu was sideways in a ditch, its front end smashed inward. People were stopping, getting out of their vehicles and rushing to help. About a dozen people were stuck inside one of the vehicles. Two bodies had apparently been thrown through a window. Then, I spotted a man sprinting away from the scene. "Where's that guy going?" I asked my friend, David Ogola, who is from Nairobi. "Matatu drivers always run away from accidents. Otherwise, they get mob justice," he said. Traffic accidents claim more than 1.2 million lives worldwide each year, and more than 80 percent of those deaths happen in low- and middle-income countries. Traffic accidents are also the No. 1 cause of death for people ages 15 to 29 worldwide, according to the World Health Organization. In Kenya, matatus, the main form of public transportation, have a reputation for being especially deadly. That's why, for years, people have tried to figure out how to make them safer. Police have put up more speed cameras. Billboards encourage drivers to slow down and avoid drunken driving. 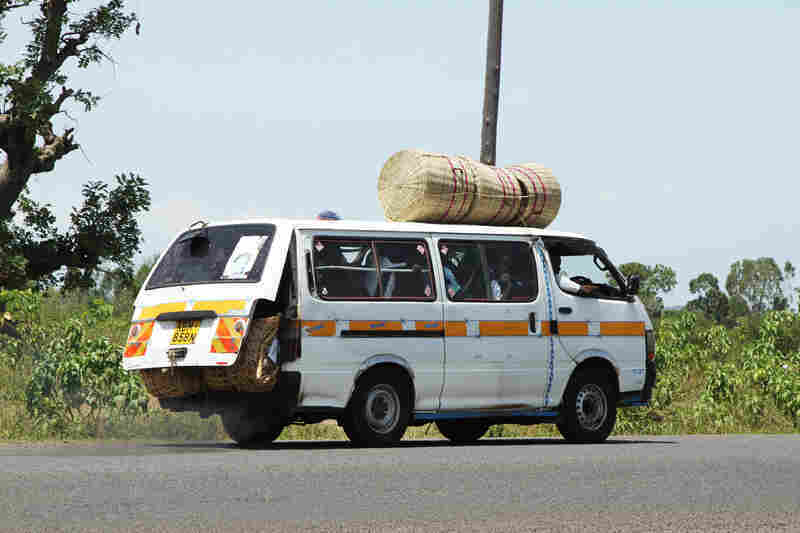 At one point, the government required all matatus to install a speed governor — a device that shuts off the engine if the vehicle exceeds 55 mph. The matatu is the passenger van of Kenya. The vehicles' operators have a reputation for driving dangerously. There's no evidence that any of these initiatives have worked. Then, a few years ago, two researchers from Georgetown University — James Habyarimana and Billy Jack — had an idea. What if, instead of focusing on the drivers, they focused on the passengers? They designed stickers with messages that encouraged passengers to speak up to risky drivers: "You have the power to slow down a reckless driver" and "Don't just sit there as he drives dangerously. Stand up, speak up, now!" They put these stickers in more than a thousand matatus and tracked them. The results were dramatic: a 50 to 65 percent reduction in traffic accidents compared with matutus without the stickers. Clearly, the stickers were making a difference. Then they repeated the experiment on a much larger scale, with different sticker designs. Some had only words, some had words and pictures (such as a crashed vehicle, a person in a wheelchair, or someone speaking up to a bad driver) and some were placebo stickers with nothing on them. The results of this expanded study are still preliminary, but they again show a significant reduction in traffic accidents: 25 percent overall and 33 percent for stickers with images and words. There's one thing the researchers haven't been able to determine: how the stickers work. They assume passengers really are speaking up, but they aren't certain. It could be something else is at work. Maybe drivers are behaving more responsibly so passengers won't nag them. But that's somewhat irrelevant to Jack. "It doesn't really bother me that I don't know exactly what was happening [in the vehicles]. What matters is that the stickers work," he says. The U.S. Agency for International Development seems to agree. In November, it awarded Jack and Habyarimana a $3 million grant to scale up the operation in Kenya. "We want to get every matatu in the country to have [stickers] — roughly 30,000 vehicles," Jack says.